The former meadowland in Abbey Road originally formed part of the grounds of Bourne Abbey and has been used for recreation for over 200 years but was bought by Bourne United Charities on behalf of the people in 1931 to be preserved as an open space in perpetuity. 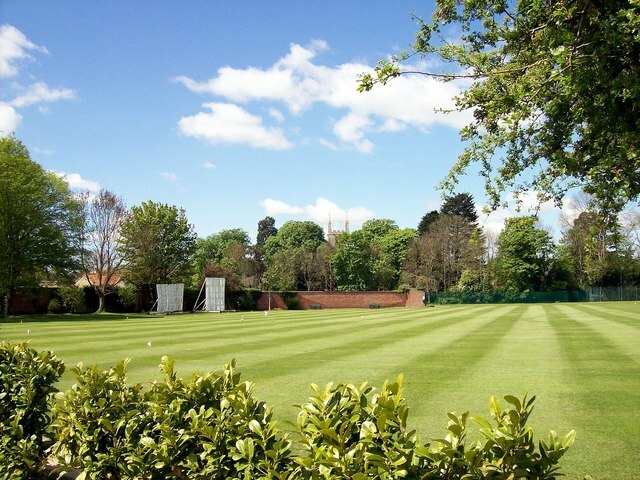 Since then, there has been a continuous programme of maintenance and improvement for both the sports playing areas and the outdoor swimming pool which is part of the complex while this section in the shadow of the Abbey Church is used by Bourne Cricket Club and is reckoned to be one of the finest grounds in Lincolnshire. © Copyright Rex Needle and licensed for reuse under this Creative Commons Licence. This page has been viewed about 196 times. The picture of Bourne Bus Station TF0920 : Bourne bus station at the height of summer makes this an appropriate square for some in formation about Delaine Buses, which runs the local bus service into Peterborough. This is one of the few remaining family-run businesses still running a traditional local bus service. These disappeared either through the general decline in bus usage or from competition following deregulation and privatisation in the mid 1980s. The main service has always been between Bourne and Peterborough vie the Deepings. For many years an hourly frequency was operated, but with the expansion of housing, particularly in the Deepings, and improvements to the road network in Peterborough which allowed shorter journey times, there are currently (2008) two journeys an hour between Bourne and Peterborough, one of which extends to Morton. The fact that the majority of the fleet are double-deck buses is an indication that levels of patronage are still high. Current fares levels are very competitive with the cost of parking in the centre of Peterborough. Unlike many other small operators, Delaine Buses have not relied on second-hand buses no longer in the prime of condition, but have pursued a policy of purchasing new vehicles whenever possible. Once bought, the fleet has always been maintained to high standards. A good example of this is that not only are the most recent vehicles fitted with CCTV (now a normal part of the specification of any new buses), but older buses have been retrofitted too. A trip on the top of a Delaine bus covers a variety of landscapes including the modern new-town development of Peterborough, the wide-open fenland landscape and the attractive stone-built towns and villages of south Lincolnshire. appear on the newest ones.